The first commercial movie theatre Boosted by FLEXOUND Augmented Audio™ will immerse moviegoers with the feel of sound starting 15th of February. The world pioneer cinema is located in the Nordic frost of Mäntyharju, Finland. You can also experience and purchase the patented technology in Las Vegas at CinemaCon, April 1-4, 2019. FLEXOUND Augmented Audio™ for cinemas complements current sound systems. It combines high-quality surround sound with physical vibration, creating a unique, immersive cinema experience. The technology offers equal sound quality in every seat independent of seat location. It improves the clarity of dialogue and enables lower sound volumes in the theatre. Augmented audio requires no wearable accessories. ”We give cinema operators a high value competitive advantage over in-home-entertainment. No remix or recode work is needed. 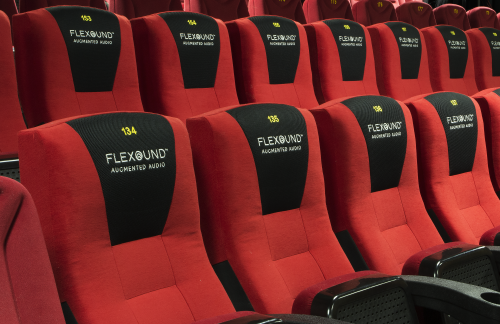 We are now working on several new cinema projects internationally, mainly in the Asian countries, but are very happy that the first Flexound cinema is in Finland.”, says Flexound’s CEO Mervi Heinaro. Makes consumers want to pay extra for an augmented audio movie experience. ”Our technology is universal and can be used for a wide range of seats. Low maintenance and a long life-span are a given. We cover the whole audio range and the vibration with only one Flexound module per seat”, says Flexound’s Chief of Cinema Mika Oesch. Experience FLEXOUND Augmented Audio™ at CinemaCon, Las Vegas on 1-4 April 2019 and secure the next big thing of cinema to your theaters.